Marion Blumenthal Lazan’s unforgettable and acclaimed memoir recalls the devastating years that shaped her childhood. Following Hitler’s rise to power, the Blumenthal family—father, mother, Marion, and her brother, Albert—were trapped in Nazi Germany. They managed eventually to get to Holland, but soon thereafter it was occupied by the Nazis. For the next six and a half years the Blumenthals were forced to live in refugee, transit, and prison camps, including Westerbork in Holland and Bergen-Belsen in Germany, before finally making it to the United States. Their story is one of horror and hardship, but it is also a story of courage, hope, and the will to survive. 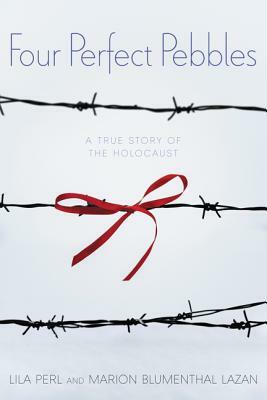 Marion Blumenthal Lazan’s unforgettable memoir Four Perfect Pebbles: A Holocaust Story (Greenwillow Books) recalls the devastating years that shaped her childhood. Following Hitler’s rise to power, the Blumenthal family — father, mother, Marion, and her brother, Albert — were trapped in Nazi Germany. They managed eventually to get to Holland, but soon thereafter it was occupied by the Nazis. For the next six and a half years the Blumenthals were forced to live in refugee, transit, and prison camps that included Westerbork in Holland and the notorious Bergen-Belsen in Germany. Though they all survived the camps, Walter Blumenthal, Marion’s father, succumbed to typhus just after liberation. It took three more years of struggle and waiting before Marion, Albert, and their mother at last obtained the necessary papers and boarded ship for the United States. Their story is one of horror and hardship, but it is also a story of courage, hope, and the will to survive. An outstanding speaker, Marion Blumenthal Lazan has shared her moving first-hand account of the Blumenthal family’s life in Germany, from the events preceding Kristallnacht to imprisonment in concentration camps to liberation in April of 1945, with upwards of one million students and adults. Her Holocaust experiences and messages of respect and tolerance go beyond the facts and inspire audiences around the world. The praise she has received from event hosts is remarkable as she evokes life-changing responses time and time again. She has spoken in public, parochial and private schools, colleges and universities, to church and synagogue groups, and to civic organizations across the United States and internationally. Marion Blumenthal Lazan lives in New York with her husband Nathaniel. They have three married children, nine beautiful grandchildren and two incredible great-granddaughters.